To purchase the exhibition catalog, Ketut Madra and 100 Years of Balinese Wayang Painting, please contact David Irons at david@dmirons.com. The catalog – 64 pages with high resolution photos of all 69 paintings in the Puri Lukisan exhibition – includes essays on the evolution of wayang painting in Bali and Ketut Madra’s life and work. 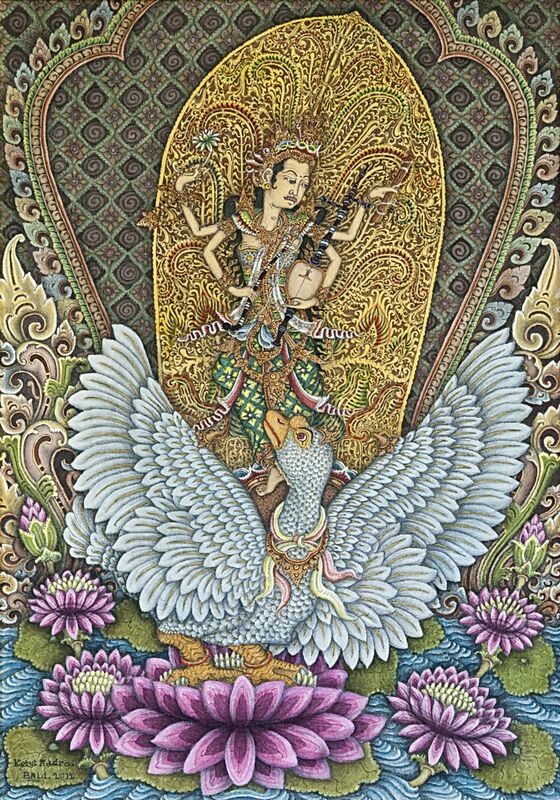 Designed as an introduction to this unique Balinese art form, the catalog also provides key information on the stories the paintings tell and the lives of the gods and demons depicted. It is available for $26.50, plus shipping. Ketut Madra’s Homestay and studio are located in Banjar Kalah, Peliatan. In Bali, please contact Ketut Madra by visiting his Peliatan studio or calling 0361-975-749, or his son, Made Berata, at 0813-9260-7411, or berataoffice@gmail.com. Outside of Bali, please contact David Irons at david@dmirons.com.